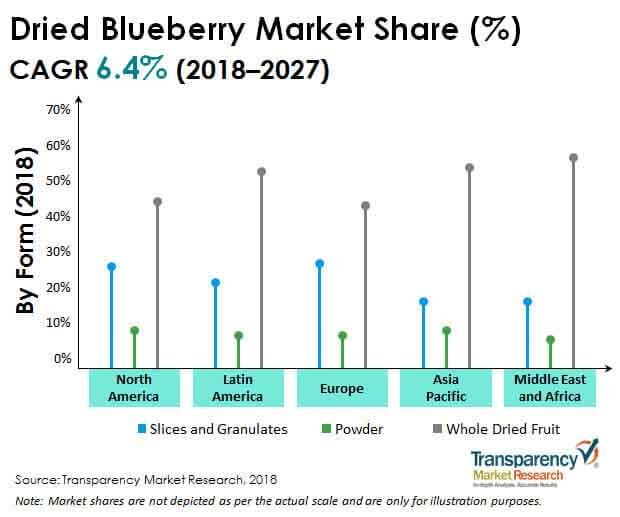 With reference to the latest market forecast report published by Transparency Market Research, titled 'Dried Blueberries Market: Global Industry Analysis and Opportunity Assessment 2018-2027', revenue generated from the global dried blueberries market was around US$ 381 Mn in 2018, which is estimated to increase at a CAGR of 6.4% by 2027 end. Dried blueberries also known as a superfruit, and finds application in food processing industry, cosmetic and personal care products, dietary supplements, and retail use. Blueberries are purple colored berries from Vaccinium genus. Blueberries are easily perishable and thus are processed, to extend the shelf life by various methods. Dried blueberries are obtained after the removal of water content from the berries with drying methods including solar drying, vacuum drying, microwave drying, and freeze drying. Drying contributes and enhances flavor, nutrition profile, shelf life, and health benefits of blueberries thus contributing to the growth of dried blueberries market. The global dried blueberries market is segmented on the basis of nature, form, end users, distribution channel, and region. On the basis of end users, the global dried blueberries market is segmented into bakery products, confectioneries, beverages, dairy products, cereal and snack bars, cosmetics and personal care, dietary supplements, food service providers, and retails, and others. The segments bakery products, confectioneries, beverages, dairy products, cereal and snack bars fall under the food processing industry and together these segments account for 49.2% market share in the year 2018 with beverage segment occupying majority share. The growing food and beverages and increasing demand for healthy and nutritious ingredients in the food products is anticipated to drive the growth for dried blueberries. On the basis of form, the global dried blueberries market is segmented into slices and granulates, powder, and whole dried fruit. The whole dried fruit segment dominates the form segment of the dried blueberries market with a market share of 58.4% in the year 2018. On the basis of nature, the dried blueberries market is expected to be dominated by conventional dried blueberries, however the organic segment is anticipated to witness a lucrative growth of 7.1% over the forecast period. The Dried blueberries market has been segmented into North America, Asia Pacific (APAC), Europe, Latin America, and the Middle East & Africa (MEA). Dried blueberries are expected to witness proliferating demand over the forecast year. North America accounts for the 46.9% market share for dried blueberries in the year 2018. The region is anticipated to register a significant CAGR of 5.9% over the forecast period, owing to the surplus production of blueberries in the region, with the US and Canada accounting for more than half of the global blueberries production. Besides, increasing use of blueberries in food and beverage industry and growing application of blueberries in cosmetics and dietary supplement in the region is further fuelling the growth for dried blueberries market. The Asia Pacific region is estimated to offer maximum growth prospects in the dried blueberries market, with a CAGR of 7.5% over the forecast period, due to to increasing industrialization, per capita expenditure of consumers, and improving standards of living. The flourishing food processing sector, growing demand for dairy products, bakery and confectionery, and increasing consumers demand for berries in the Asia Pacific are driving the growth of the dried blueberries market in the region. Transparency Market Research has outlined the most important companies that are players in the global dried blueberries market, such as Bergin Fruit and Nut Company Inc., Del Monte Foods, Inc., Graceland Fruit, Shoreline Fruit, LLC, Royal Nut Company, CAL-SAN Enterprises Ltd., Karen's Naturals, Kiantama Oy, Meduri Farms, True Blue Farms, Helsu International BV, Oregon Berry Packing, Inc., and Naturipe Farms, LLC. Manufacturers of dried blueberries are branding dried blueberries as ‘superfruit’, highlighting its health benefits to attract larger consumer base. Besides, the food processing manufacturers are using dried blueberries in production of flavored drinks, juices, flavored yogurt, and other food products attributing to the increasing consumers demand for blueberries flavored products. Manufacturers are also finding more efficient technologies and methods for drying the blueberries to enhance the nutritional aspects and flavor profile of the product.